Believe me!! It was not so easy to get this shot atleast for me.. I took 4 to 5 to get this one. I wanted to frame in such a way, the pic shouldn't contain just me... so for the feel of mirror, I have captured the design on it and the objects behind me. I tried with autofocus the result was focus on mirror, curtain or the wall but not me..then i tried with manual focus and here is the result..
Added to this .. one more difficulty was to keep the other eye open which would not let me see through the camera.. Yeah!! a different kind of experience to portrait self..
this is not a different idea or shot as you've mentioned, and maybe you should try using the focal points (check your camera's manual) and lock the shutter by pressing it firmly the to get the idea that you want!!! 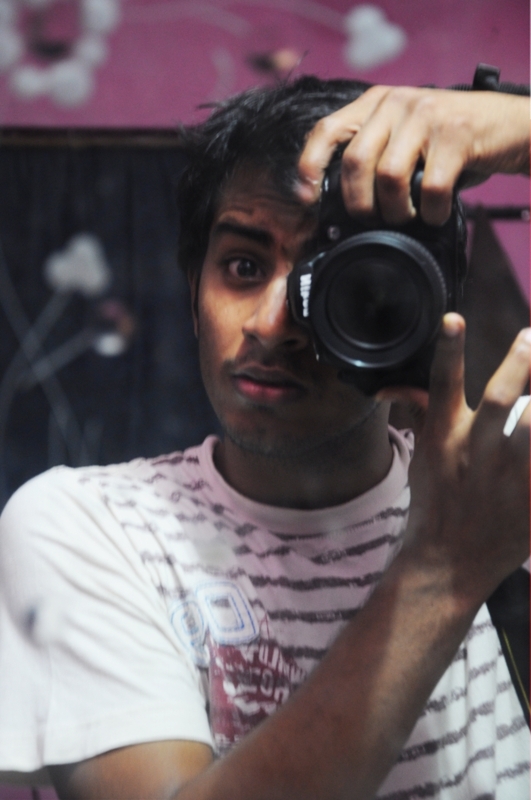 A shot of Myself on the mirror! is a different idea and very creative. hi. try to focus on the eye. you will get a sharper image. by the way, if you want hdr photos, try to use photomatix (a computer program) for hdr postprocessing.